Calcium oxalate (in archaic terminology, oxalate of lime) is a calcium salt of oxalic acid with the chemical formula CaC2O4. It is a chemical compound that forms envelope-shaped crystals, known in plants as raphides. A major constituent of human kidney stones, calcium oxalate is also found in beerstone, a scale that forms on containers used in breweries. 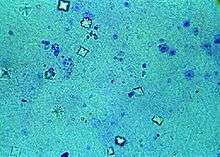 Calcium oxalate is a poisonous substance that can produce sores and numbing on ingestion and may even be fatal. Many plants accumulate calcium oxalate as it has been reported in more than 1000 different genera of plants. The calcium oxalate accumulation is linked to the detoxification of calcium (Ca2+) in the plant. The poisonous plant dumb cane (Dieffenbachia) contains the substance and on ingestion can prevent speech and be suffocating. It is also found in rhubarb (in large quantities in the leaves) and in species of Oxalis, Araceae, Arum Italicum, taro, kiwifruit, tea leaves, agaves, Virginia creeper (Parthenocissus quinquefolia), and Alocasia and in spinach in varying amounts. Plants of the Philodendron genus contain enough calcium oxalate that consumption of parts of the plant can result in uncomfortable symptoms. Insoluble calcium oxalate crystals are found in plant stems, roots, and leaves and produced in idioblasts. Calcium oxalate, as ‘beerstone’, is a brownish precipitate that tends to accumulate within vats, barrels and other containers used in the brewing of beer. If not completely removed in a cleaning process, beerstone will leave an unsanitary surface that can harbour microorganisms. Beerstone is composed of calcium and magnesium salts and various organic compounds left over from the brewing process; it promotes the growth of unwanted microorganisms that can adversely affect or even ruin the flavour of a batch of beer. About 80% of kidney stones are partially or entirely of the calcium oxalate type. They form when urine has been persistently acidic. Some of the oxalate in urine is produced by the body. Calcium and oxalate in the diet play a part, but are not the only factors that affect the formation of calcium oxalate stones. Dietary oxalate is an organic ion found in many vegetables, fruits, and nuts. Calcium from bone may also play a role in kidney stone formation. ↑ Francesci, V.R. ; Nakata (2005). "Calcium oxalate in plants: formation and function". Annu Rev Plant Biol (56): 41–71. ↑ Martin, G; Matteo Guggiari; Daniel Bravo; Jakob Zopfi; Guillaume Cailleau; Michel Aragno; Daniel Job; Eric Verrecchia; Pilar Junier (2012). "Fungi, bacteria and soil pH: the oxalate–carbonate pathway as a model for metabolic interaction". Environmental Microbiology. 14 (11): 2960–2970. doi:10.1111/j.1462-2920.2012.02862.x. ↑ Johnson, Dana (23 March 1998). "Removing Beerstone". Modern Brewery Age. Birko Corporation R&D. Retrieved 2007-08-06. ↑ Nash, Alanna. "The Black Widow Killer: Two men. Two murders. Too many questions.". Reader's Digest. Retrieved 2009-04-26. ↑ "CALCIUM OXALATE HUMMEL CROTON". Hummel Croton Inc. Retrieved 2012-05-02.